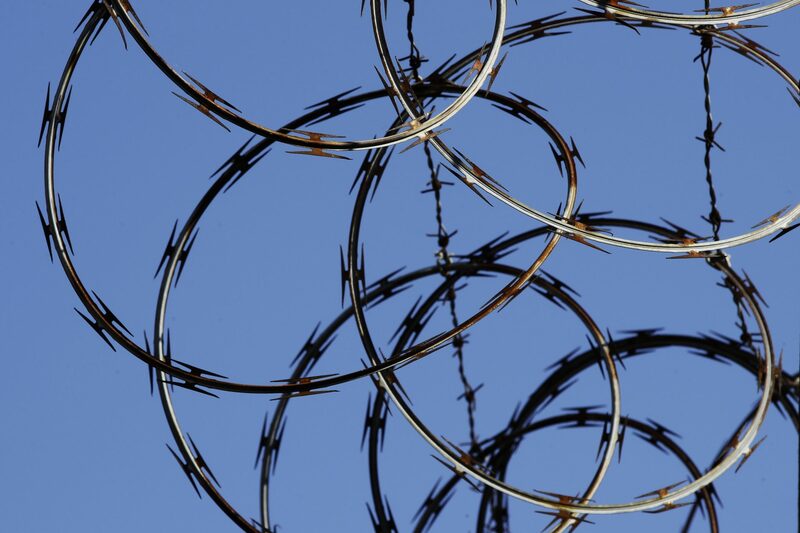 In this Tuesday, Oct. 23, 2018 photo, barbed wire lines the top of a wall at the deactivated House of Correction in Philadelphia. Earlier in 2018, the city announced plans to close the facility amid a decline in the jail population for the city. Here’s a look behind the jails’ reports. In the map below, yellow dots represent jails that reported no deaths and red dots represent jails that reported at least one. Click on a dot for information about the number of suicides, other deaths and attempted suicides. You can also see how many inmates were typically in the facility during a given month. For Philadelphia, separate reports are made for jails. The location of the facilities is approximate. Some small counties do not have jails. There were typically more than 30,000 total inmates in county jails across the state each month. Over several years, Montgomery County in suburban Philadelphia has ranked high for the number of attempted suicides reported — both in raw numbers and when you adjust for the number of inmates at facilities. But John Corcoran, a spokesperson for the county, said the county ranks high because staff at the jail “take suicide prevention so seriously.” Staff will send inmates to the medical division and place them on suicide watch if there’s any indication of suicidal thoughts, he said. There are four categories for counties to report: natural, accidental, by homicide, by suicide. Claire Shubik-Richards, executive director of the Pennsylvania Prison Society, which advocates for inmates, said her organization also looks into problems that could have led to deaths labeled as natural. Sometimes those deaths could have been prevented with proper medical attention, she said. The information is based on what counties report to the Pennsylvania Department of Corrections. And it’s possible the counties make mistakes. For instance, PA Post spotted discrepancies between what York County jail officials reported for 2018 and what news accounts described last year. We reached out to York County, which then reviewed its numbers and corrected them with the state. The state data also doesn’t include names and other identifying details for those who died in county jails. And the way the reporting requirements are written for counties, jails are supposed to describe any “extraordinary occurrence” for inmates, prison employees, contractors, volunteers or visitors to a jail. That means it’s possible that the deaths included are not just of inmates, said Susan McNaughton, a spokesperson for the Pennsylvania Department of Corrections. But Shubik-Richards said the data is still useful. 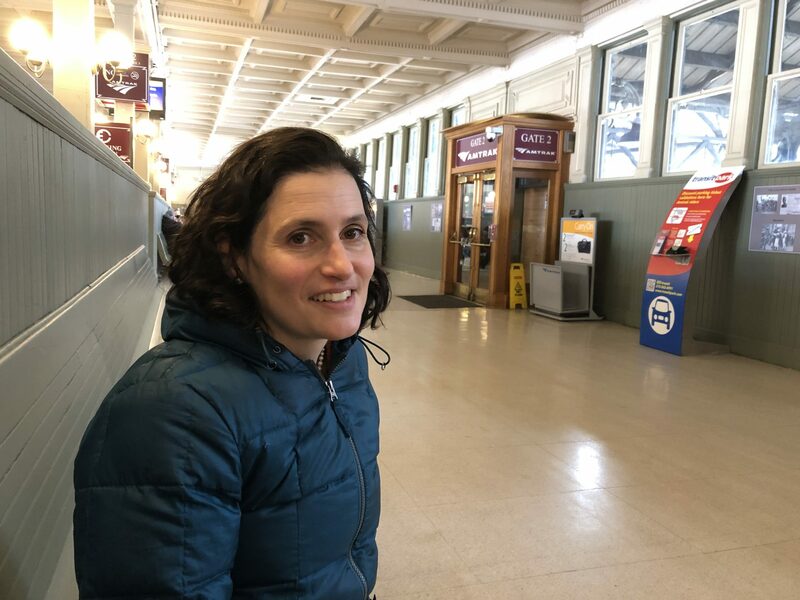 Claire Shubik-Richards, executive director of the Pennsylvania Prison Society, is seen on Wednesday, Feb. 26, 2019, at the Harrisburg Transportation Center. Her organization is based in Philadelphia but she was in the state capital for meetings. John Sallade, managing director of insurance programs for the County Commissioners Association of Pennsylvania, works with most of the county jails in the state to handle death cases and other potential lawsuits. He thinks counties are always assessing how they respond to suicide risks. “This is not only a horrible, traumatic experience for the family of someone who commits suicide. This is not something that anybody wants to have happen in their workplace,” Sallade said. He said, in general, newer facilities see lower suicide rates. That’s what The Marshall Project, a journalism organization focused on criminal justice issues, reported in 2015. The organization compared the 2013 suicide rate for local jails, which was 46 per 100,000 inmates, to the age-adjusted suicide rate among the general population. That general population rate was 12.6 suicides per 100,000 people in 2013. County jails are mainly for people who have been charged with a crime and are awaiting trial, or they’ve already been found guilty but have received a relatively short sentence. Shubik-Richards, with the Pennsylvania Prison Society, pointed to two reasons for the higher suicide rate for people in jail. One, she said, there’s a higher rate of mental illness for people in custody, generally. “And … even without mental illness, the outlook on one’s life and one’s future — if you’re confined behind bars and deprived of your liberty — is often pretty bleak,” she said. In 2017, a lawsuit over the suicide of a Delaware County inmate ended with a $7 million settlement, Philly.com reported. News reports have cited that case when describing efforts by some Delaware County residents to push out the for-profit prison operator who manages the jail there. Philly.com has also looked at a rise in suicides at state-run prisons, and possible explanations. Last year, Lebanon County agreed to pay nearly $5 million to the family of a teenager, who died after suffering from heroin withdrawal in jail, The Associated Press reported. In Bucks County, there were multiple occasions when county officials didn’t release any information about an inmate’s death until media members made inquiries, the Bucks County Courier Times reported earlier this year.